Other Tropicals can be easily grown in the sub tropical climate of Phoenix. These include, Tropical Bird of Paradise, Banana, and many Tropical fruit trees such as; Guavas, Loquats, Lychee and Mangos. But since our site is primary focus on tropical flowering plants we have set up this page to dicuss the Hibiscus Shrub that we are growing along with our plumerias. First we will briefly discuss the native Hawaiian Hibiscus and then in more detail the "Tropical Hibiscus" and how to grow them in our harsh desert enivornment. 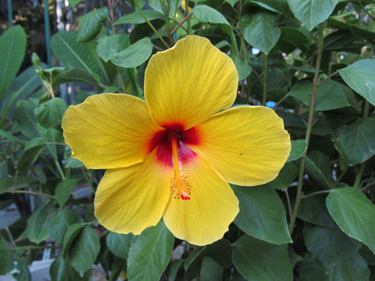 Hawaiian hibiscus are the seven known species of hibiscus regarded as native to Hawai‘i. 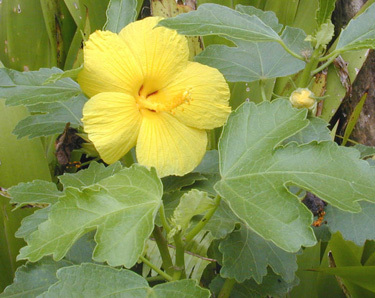 The ma‘o hau hele, (pictured below),which is Hawaiian for Hibiscus is the state flower of Hawai‘i.Although tourists regularly associate the hibiscus flower with their experiences visiting the US state of Hawai‘i, and the plant family Malvaceae includes a relatively large number of species that are native to the Hawaiian Islands, those flowers presented to or regularly observed by tourists are generally not the native hibiscus flowers. Most commonly grown as ornamental plants in the Islands are the Chinese hibiscus (Hibiscus rosa-sinensis) and its numerous hybrids. The native plants in the genus Hibiscus in Hawai‘i are thought to have derived from four independent colonization events: two for the five endemic species (four closely related species plus the yellow-flowered species) and one each for the two indigenous species. Follow this link for more details about the native Hibiscus species in Hawaii Hawaiian Hibiscus. Hibiscus rosa sinensis, Tropical Hibiscus is a genus of flowering plants in the mallow family, Malvaceae. They are large shrubs or small trees native to China that produce huge, colorful, trumpet-shaped flowers over a long season. Hibisucs Other common names include Chinese hibiscus and tropical hibiscus. 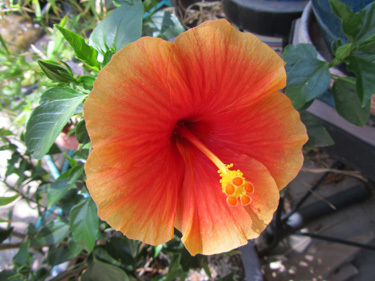 Tropical hibiscus is fairly easy to grow in the Phoenix area. It takes the summer heat well but is damaged when temperatures drop below freezing. It flowers almost all year and is especially productive in spring. Tropical hibiscus take the summer heat well if regularly watered. They will be more attractive overall if they receive afternoon shade, even though direct sun for part of the day is necessary for flower production. Some varieties of tropical hibiscus take the heat better than others. The Culitvar,"San Diego Red", is one of the most sun tolerant varieties. Hibiscus start being damaged when temperatures drop to 29 F. Prolonged exposure to temperatures at or below this will kill a hibiscus to the ground. However, a hibiscus will often be able to grow back from its roots. Hibiscus are evergreen to semi-deciduous shrubs with dark green leaves; the plants can grow to 15 feet tall in frost-free areas. Flowers may be up to 6 inches diameter, with colors ranging from yellow to peach to red. Hibiscus can be planted singly or grown as a hedge plant; they can also be pruned into a single-stemmed small tree. The flowers are attractive to butterflies and hummingbirds. Plant in spring, summer, or fall, spacing plants 3 to 6 feet apart. Dig a hole at least twice the size of the rootball. At a minimum, make the hole 2 feet in diameter and 1 foot deep.Work in a 50/50 mix of compost to soil. Be sure to mix the compost and soil as thoroughly as possible. Carefully remove the plant from Fill the hole half full with soil, then water it well to settle the soil and eliminate air pockets. Let the water drain, then fill the remainder of hole with soil and water thoroughly. It also is a good idea to finish with the hole an inch or two recessed so that a watering basin is formed. Most of the year hibiscus do well on a grass watering schedule. During winter the plant will be green but is almost dormant so it needs very little water and can be switched to a citrus watering schedule. Watering a hibiscus too much during winter will make it chlorotic. Basin or flood irrigation is recommended because it helps keep the salt in our salty water from accumulating around the roots. Furthermore, deep watering will encourage the plant to develop deeper roots, making it tougher when the weather gets hot and dry. Hibiscus grow at a moderate rate and therefore consume a moderate amount of nutrients. Organic methods can be used to keep them healthy and these methods can also be supplemented with small amounts of chemical fertilizers. The simplest and most effective organic fertilizer is compost which can be spread around the base of the plant at a depth of an inch. Slow release chemical fertilizers are recommended, and varieties that also acidify the soil will help the plant look greener. Hibiscus are propagated from cuttings. Cuttings maybe taken from either green wood or semiwoody or gray wood. 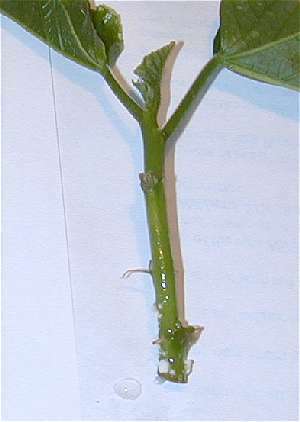 The green, wood cuttings are easily rooted in water. These cuttings should have a bark that is still smooth and green in color (or reddish green in some varieties). Semiwoody cuttings work too but really older wood roots better when they are planted directly in the soil. It seems keeping woody cuttings in water makes them more prone to rot. 1. 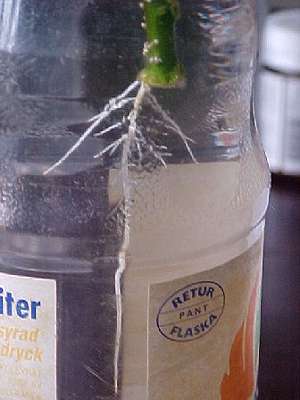 Take new cuttings, also called green, wood cuttings and root them in water. That means the bark is still smooth and green in color (or reddish for varieties with red bark such as Pride of Hankins). Semiwoody cuttings work too but really old wood does better rooted directly in dirt. It seems that keeping mature bark in water tends to lead to rotted cuttings and thus damages the newly forming roots. 2. Cut the plant material in pieces of 4-6" (10-15 cm) in length but no shorter than 3" (7.5 cm) and preferably no longer than 10" (25 cm). 3. Remove most of the leaves but save 2-3 for oxygen uptake. If the remaining leaves are large cut them in half across. 4. Pour 1-2" of warm (body temperature) water into a container. Add a few drops of hydrogen peroxide to discourage microbes from multiplying in it. 5. Place the cuttings in the water. 6. If desired place a sprig of willow (salix spp.) in the water together with the cuttings. It releases a natural rooting hormone that will aid root development. 7. Situate container in a light place but not in direct sun as that will dry out your cuttings. 8. Change the water about once a week and continue adding the hydrogen peroxide each time. Also remove any fallen leaves or other debris from the water as it will start to decay and make the water unsuitable. If at any time the water becomes murky replace it and rinse the cuttings thoroughly. 9. Callus (white little bumps on the stems) will begin to appear in a week or so. The amount of callus formation does not indicate the amount of roots. Sometimes roots form with very little callus, sometimes you get excess callus and little or no roots. 11. 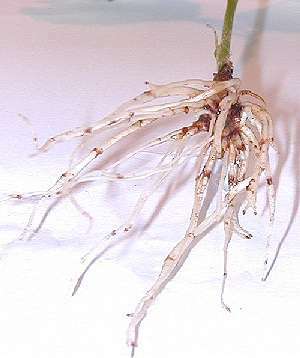 Leave the plant in water until the roots have started to change from white to a light tan. 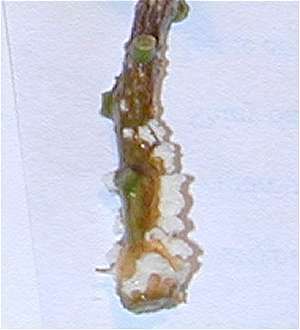 This occurs about 2 months after "sticking" but can take up to 3-4 months, again depending on variety and time of year. The roots are now hard enough to plant in dirt without breaking. 12. Plant in your regular hibiscus soil, if possible one containing coco coir rather than peat, as coco doesn't have the unhappy tendency of peat to shrink when dry. Avoid planting your cuttings in pure peat - always mix in humus rich material with it. Well developed root ball. Time to plant! Hibiscus can be planted in a potting soil for hibiscus is a ready bought mix that contains peat, composted manure and composted bark. Prepare the soil mix by mixing 1/3 Perlite or pumice, 1/3 sand and 1/3 Potting soil. You can add a pinch of bone meal and soil sulphur to the mix. These aid in adding a low grade organic fertilizer to the soil and sulphur has antifungal properties which help prevent rot. If you desire even more drainage you may add additional Perlite or pumice. During the hot dry season a bag can be placed over the newly planted cuttings, to create a humidity chamber. Do not put the new pots in direct sun until the plant has firmly established itself which takes 2-4 weeks usually. Success rate depends on variety. For Double Red, Pride of Hankins and Brilliant the success is close to 100%. For some other varieties much lower. Please note that some exotic varieties won't root at all but have to be grafted. Here is a link to a site on grafting hibiscus for the beginner. It is well worth a visit.